Hello friends and welcome to the first edition of Friday Photo Journal 2014! I'm so glad you are here and I hope you will enjoy this project. 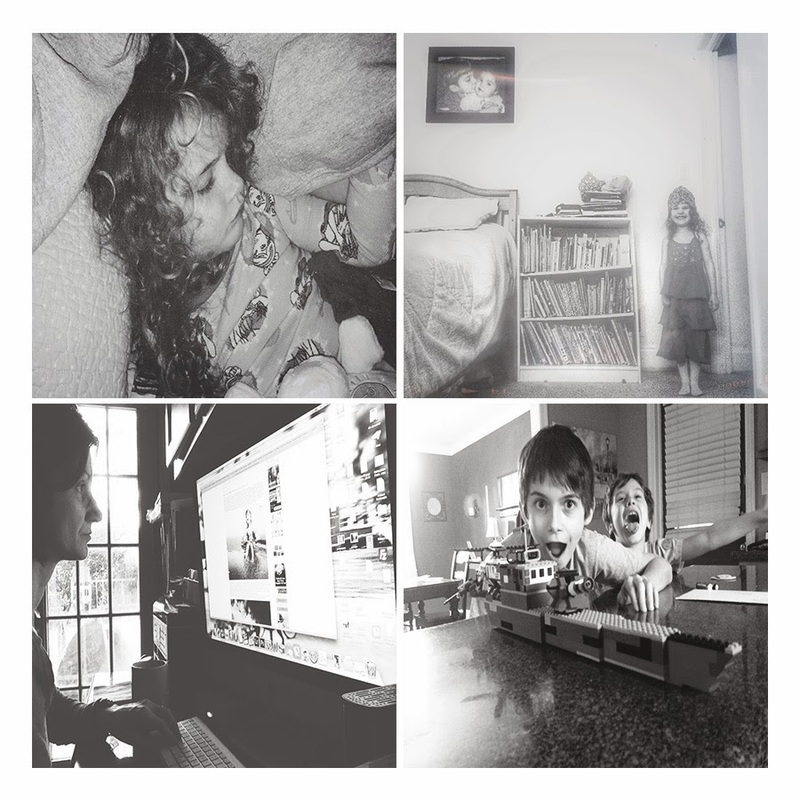 I started this blog hop in 2013 as a way to help me document our daily lives. It pushes me to capture more images of the little moments we share as a family and to also organize and share them regularly - kind of like a 365, without the pressure of every day. I hope you will shoot and share your favorite everyday moments with us here each week. This week I had some kids down with a cold, and they really weren't up for many photo ops. I only took a few images with my phone. To be honest, I have had the winter blahs as well. I am really not a fan of the cold, gray days and can feel housebound and rather blue in winter. Fortunately, we are expecting a warm up this weekend. It will bring rain too, but I'll take it! I'd rather dance in rain puddles than stomp around in the frozen grass, lol. We rarely get snow here, just cold. But, I shouldn't complaining too much. At least our winters are short. Now - onto this week's pics! 1. Sleepy little sick one. 4. My Lego Man. He felt inspired and built it in a day. I like to see pictures from everyday life. Awww...I hope she is feeling much better! Sorry the kids were sick! Hope you're all on the mend and have a nice weekend! Hope you all are feeling better. The up and down temps seem like a great opportunity to get sick. Your babies sure are precious! Get some rest if you can my friend- the cold days are few ahead at this point :) Before you know it we will all be sweatin' again. There has been lots of colds and sickness around. I am guessing from the crazy weather everyone has been having. Here, one day is well below 0, and the next day is in the 40s. Really strange. I hope everyone is all better real soon, Melissa. Hope everyone is up and attem' soon! I sure know about those winter blahs!! I haven't been really too bad so far, but February is always a rough month for that here. I hope everyone is feeling well soon!! Enjoy your weekend and warmer temps! Melissa, what lovely photos you have shared on your 1st post of the year! I always enjoy your Photo Friday's...thanks for hosting! Winter blahs... me too! It is so hard for me to be inspired during the monochromatic months.